There are 2 types of motivation, the intrinsic and the extrinsic motivation. Each of them affects us differently. And if you want to learn how to go through each day feeling motivated, getting fired up to take action and work on your goals, you must learn how to channel your motivation in the right way. And this is exactly what you’re going to discover in this article. Motivation is the desire to want to do something. And this desire is what makes us do what we do in every area of our lives. We need motivation to take action. Whether you are writing an article or working out in the gym, you need motivation. I don’t agree with people who say that motivation is crap. We all need some form of motivation to propel us into taking action. Even when you have developed the action as part of your habit, you still need a little motivation and drive to kick-start the habit. As an employee, you need motivation to get to work, to perform better, and to achieve the sales target that your company has set. As a writer or a blogger, you need motivation to write and publish good quality content. Without motivation, you will have a difficult time to force yourself to sit in front of your computer and to type. Everything we do in life requires motivation. Some require a huge amount of it, while others require only a small amount. Imagine if you can have all the motivation you want, what do you think will happen? Will you achieve all your goals and dreams? Will you become unstoppable? People fail to achieve their goals often is because they fail to find the motivation to consistently work on their goals. They are extremely motivated in the early days after they set their goals. However, as the days go by, they started to lose steam and are distracted by other stuff in their daily life. As a result, their motivation plummeted and eventually, they lose all their interest and motivation to take action on their goals. If this describes you, continue to read on because you are going to discover the 2 types of motivation that can keep your drive high and consistent in your journey. So what is intrinsic motivation? Well, intrinsic motivation means that when your behavior is motivated by your internal desire to do something. For instance, your personal enjoyment of an activity. You feel good when you read a book because you enjoy the story. You enjoy playing golf and this internal drive gets you up early in the morning to enjoy the game. When you participate as a volunteer to help out in the church or any charity event, these events may give you a sense of progress when you see that your work is accomplishing something positive and you are contributing to the society and the world. Intrinsic motivation is the drive that comes from within. It can be your passion, your hobby, or something that you feel pleasurable doing it. Passion is also a form of intrinsic motivation. When you are passionate about something that you do, you are willing to do it without much external reward. Another type of motivation is the extrinsic motivation. This type of motivation is the opposite of the intrinsic motivation where your desire to do something comes from the external event. Extrinsic motivation refers to your behavior that is driven by external factors such as money, fame, praise, luxury items, and more. Think about reading this article right now. Why do you read this article? I know that you want to get motivated, but why do you want to have the motivation? If you are a student, do you want to get motivated to excel better at school and to get better grades (extrinsic)? Or perhaps, you want to get motivated so that you can work harder to achieve your goals and to earn more money (extrinsic)? On the other hand, if you are reading this article because you simply love to understand more about the psychology of humans, reading this article becomes an intrinsic drive and not extrinsic. Some people work because they are motivated by the money and the paycheck that they are going to receive. There are also people who work not because of the money, but because they truly love their work and they are willing to do it even without pay. Is it Bad to be Extrinsically Motivated? At first glance, many people think that extrinsically motivated is bad, which is really not. When you are motivated extrinsically, it doesn’t mean that you are materialistic or you only pursue outside rewards. For example, you study have and you spend hours on reading books to prepare for your exams because you want to get good grades in school. And there is nothing wrong with getting good grades in school. If you have a job and you work hard because you want your manager to praise you or give a pay raise, there is nothing wrong with this too. Personally, I believe that extrinsic motivation may not necessarily be bad unless you blindly chase for the things that you desire. Working hard for money is not something bad, but breaking the laws and do things the unethical way just to get the money are totally wrong. Thus, don’t mix up extrinsic motivation with wrongdoings. You can be extremely motivated to own your dream car, but that doesn’t mean that you should get it in the wrong way. Leveraging on extrinsic motivation can be one of the keys that determine our success in life. Some people are so extrinsically motivated that they are willing to go all out and to achieve amazing results in their lives. Just understand that extrinsic motivation is just another form of motivation, there is no good or bad. It depends on where you channel your motivation to. So you want to be motivated to achieve great success in life? Here are a couple of good ways how you can raise your intrinsic motivation. Always start with your inner purpose. This is because to be intrinsically motivated, you have to understand your inner drive. And it starts with your clarity on your desire. A lot of people have no idea what they want to accomplish in life. They live a reactive life and respond to whatever that comes to them. Discover your clarity and find out your purpose. When you know why you want to achieve your goals, the definiteness of purpose will clear away your doubts and help you focus better on achieving them. Therefore, get clear with what you want to achieve and understand your purpose. When you have the clarity, the motivation will come. Another good way to increase your level of intrinsic motivation is to always be curious to learn and discover more. You must aim for mastery and strive for it. Regardless of what you do in life, if you want to become better at it, you must be willing to commit to discovering more, learn more, and strive for improvement. Take a look at all the highly successful people out there, they are curious to learn. They are always looking for ways to do better and to improve their crafts. Elon Musk is striving to dominate Mars. And to do so, he has to learn the most efficient way for interstellar travel. Thomas Edison was driven to brighten up the world. And thus, he was curious to learn about light emission and was always learning to improve on his craft. The same goes for professional athletes like Kobe Bryant and Lionel Messi. They strive for mastery because they are curious and passionate about what their skills. In the best-selling book, Drive, written by Daniel Pink, he said that people are also motivated by our self-direction, which is autonomy. Pink pointed out in his book, giving examples of how children played on their own terms, have the most fun and experience with the highest drive. The same goes for adults. Without autonomy, we feel lack of control and also no freedom to express our inner drive. Giving autonomy to employees and allowing the freedom of ideas to flourish is one of the most underestimated ways of boosting motivation in the workplace. This Forbes article states that employees need to have their own set of goals, not just what you tell them what to do. In other words, you want to have your team to see that the goals they are pursuing have real value. This is why autonomy is important. If you are working in a team, provide a higher level of autonomy and give freedom to your team members to come up with their own goals and methods to reach your company’s goals. Motivation and your inner drive is a huge topic. And if you want to learn more about getting more motivated and get driven intrinsically, read Daniel Pink’s book, Drive. 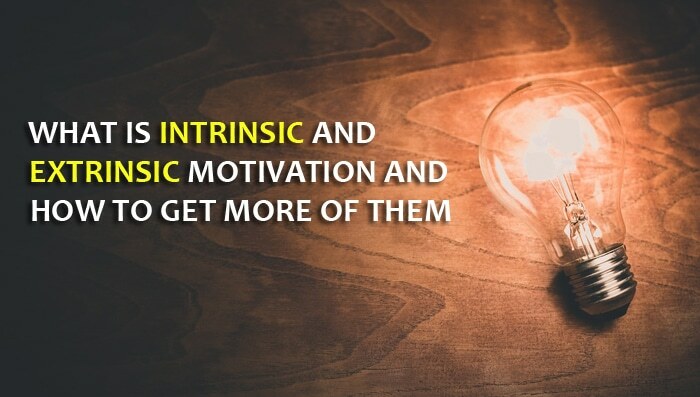 Now that you understand how to get motivated intrinsically, it is time for you to discover the other category of motivation, extrinsic motivation. When it comes to extrinsic motivation, one of the most important factors that is going to affect your level of motivation is the reward. And because of this, you must make sure that you choose the right reward as your ‘carrot’. Do you want to make a lot of money because you want to buy a house for your mother? Les Brown, the famous motivational speaker was so inspired to achieve financial success because he wanted to buy a house for his mother. This extrinsic reward has driven him to go through all the odds and work hard day and night. So what are the rewards that you truly want? What are the things that every time when you see them, you feel driven and are motivated to take action? By the way, you don’t have to compare the rewards you want with someone else. What motivates others may not motivates you, and vice versa. I once enrolled in Eban Pagan’s internet marketing course, and in one of his video training, he said that he used a headphone as the reward for his hard work. Of course, Eban is rich and he can afford the headphone, but the headphone means much more than just money. And thus, Eban committed to work hard and if he reached his goal, he would buy himself the headphone, which he did. So what are the things that drive you? What are the rewards that can motivate you to take massive and consistent action? Another way to increase your extrinsic motivation is to recognize and acknowledge your effort and hard work. Meaning, you have to feel proud of what you have done and celebrate the progress that you have made. You want to feel good every time you hit the publish button on your blog. You want to feel proud every time after you sweat in the gym. You want to celebrate and enjoy the small little success every time after you have taken some action. Therefore, celebrate not just every small victory you won, but also every progress and hard work you have poured in. This way, you train your mind to associate feeling good with taking action. And as a result, you will want to take more action because it is pleasurable. Competition can be good. It is just like how the Goldilocks Rule explained. With the right level of competition, you feel more motivated to work on the tasks. Imagine if you are a good tennis player and you have to play against a complete rookie who does not know how to play at all. The game will be boring to you, right? On the other hand, if you are playing against an international player, the match will be too difficult to you (but too easy to your competitor), hence, you will quickly lose motivation because the match is just way too difficult. However, when you play against an opponent who has a similar level of skills like you, the match can be fun, exciting, and you will feel the most motivated to play. Therefore, you must encourage the right level of competition while reaching your goals. If you are a blogger and you have just started to blog, you don’t have to approach the big names for a guest post, start with other similar bloggers at your level. This way, your chances of successful pitching for a guest blog post will be higher. And as your level increase, go and approach other bigger players in the industry. Now that you know what is intrinsic and extrinsic motivation, and you have also learned how you can increase them. What you can do right now is to boost your level of motivation even higher by combining both the intrinsic and extrinsic motivation. You want to make use of the push-pull effect. For instance, finding your purpose drive and push you to achieve your goals. And when you include a reward along the process of reaching your goal, you are using the reward to pull you toward taking action and getting motivated as well. The push-pull effect will give you the most motivation. Just like when you avoid pain and move toward pleasure. Try to align both the pain and the pleasure on the same line and you will have the most motivation. At one hand, you are driven to achieve your goal because you know your purpose and are committed to strive for mastery. On the other hand, you have a strong and exciting reward motivating you to work harder. Thus, combine both your intrinsic and extrinsic factor for peak motivation. Remember the factors that influence both your intrinsic and extrinsic motivation. Use both the intrinsic and extrinsic factors to motivate yourself to the max. Do you like what you read? If you do, please share with your friends. If you don’t, let me know your opinion in the comment section below. Cheers.